The heroes. Our natural sciences collections, collections staff, the planet and all the players worldwide (thanks Shakespeare). Some of the heroes’ dilemmas. Need for online access to collection specimen data for research, dwindling habitat, damaged planet resources, one-of-a-kind objects, minimal staff, need for financial support and expertise, and an urgent need to reach and engage a broader audience if we are to succeed in addressing these dilemmas. Some actors know their roles, others don’t even know they are part of the story. With support from the John Ellerman Foundation for the South West Area Natural Sciences collections (SWANS) project, Bristol City Council’s Culture Team (based at Bristol Museum & Art Gallery), the Natural History Museum (UK), and iDigBio, jointly created two workshops. 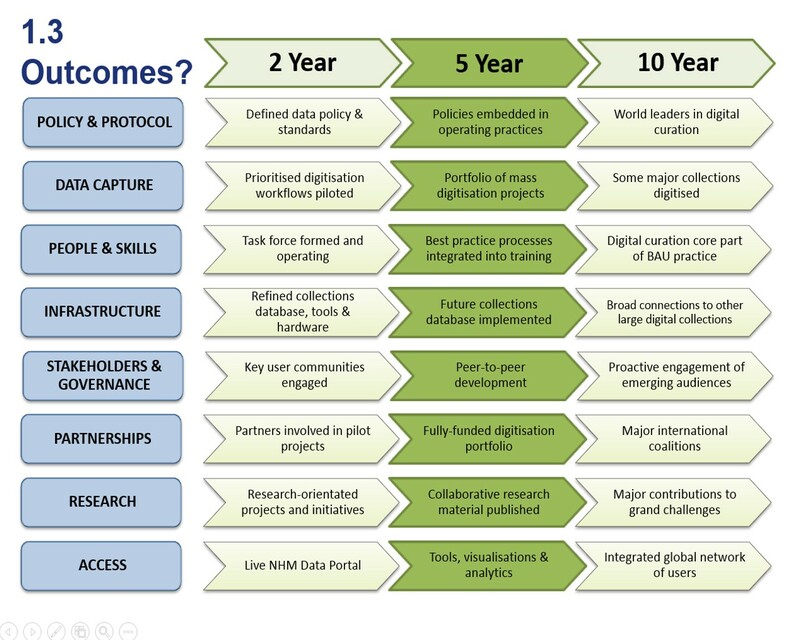 Both of these events serve as part of a coordinated effort to envision and create a robust UK regional digital natural sciences collections program that supports research, engagement and skills, and connects directly to local, national, and international programs now and in the future. The vision includes plans to repeat the second workshop across the UK. Materials. All materials and talks can be found on the respective workshop wikis: UK Strategy and SWANS Practical Digitisation. Workshop One. A UK Strategy. 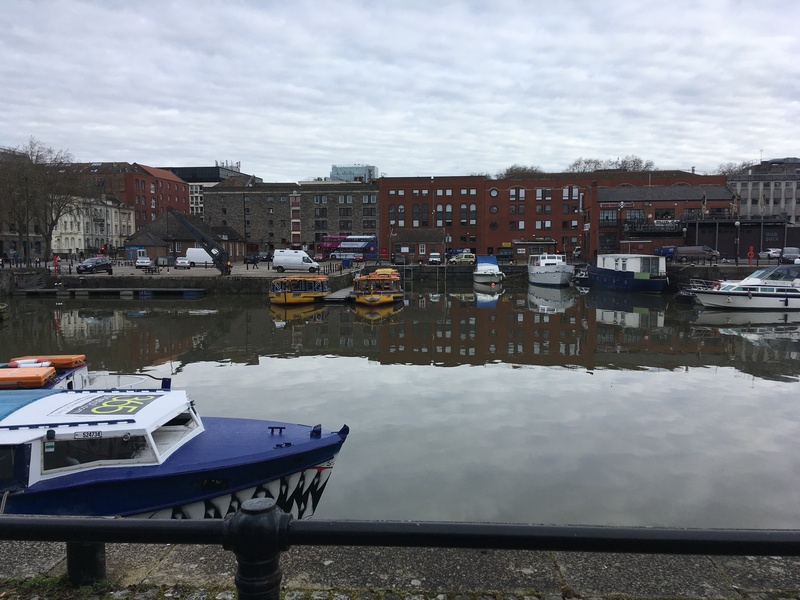 On 8th March 2018, thirty-two participants found their way to M Shed in Bristol to work on collectively envisioning a collaborative approach to mobilising specimen biodiversity data currently locked in UK natural sciences collections. Our goal was to develop the foundations of a strategy that will enable UK collections of all sizes to contribute to the global biodiversity digitisation effort. We are working together under an umbrella narrative that reveals potential value of this work in answering big questions facing humanity today at local and global levels. Our focus is on implementation models that incorporate additional drivers such as engagement, diversity and skills. Participants representing a range of stakeholders included museum directors, administrators, coordinators, producers, computer science experts, heads of collections, curators, collection managers, digitisation and workforce training specialists, citizen science experts, and program officers. We learned about current local, national, and international initiatives and found inspiration in shared stories. Topics ranged from citizen science, story-telling, benefits mapping, and engagement, to planning for and sustaining international collaboration in challenging times. We took on three tasks for the day: generate a list of benefits and models of collaboration, note key audiences and stakeholders and activities needed to meet needs of these groups, and come up with a vision, a mission and a story. Kathryn Jeffs (@kathrynjeffs on twitter), from the BBC Natural History Unit, and Producer and Director of Blue Planet II, guided and inspired us while sharing the elements of compelling storytelling. To realize a thriving UK digital collections network of we need a hero. It could be the planet, or [your hero here]. The hero has a problem – and we need to share potential solutions / resolutions for this hero. She stressed the need to engage people emotionally via joy and wonder, through a journey. We must have a story – not a litany of facts – if we are to succeed in our quest. To begin our journey to find our heroes and define their quests, we first heard about related regional, national, and international contexts from Isla Gladstone (UK South West), Vincent Smith (NHM and global outlook), and Deborah Paul (iDigBio and the ADBC (USA)). Next, Jo Judge shared the current progress of the National Biodiversity Network (NBN) including the potential for sharing biocollections data via their new ALA platform. From the Manchster Museum, Henry McGhie shared his vision for how to connect internationally and what challenges he sees for doing this in (economic) hard times. Lucy Robinson relayed the current role of citizen science in digitising collections at the NHM. We heard from Victoria Harding (South West Museum Development) about issues we need to address for engaging a wider museum sector audience especially when it comes to workforce skills and diversity. And then, Helen Hardy (NHM) presented an overview about measuring the impact of digitising collections to guide our vision and expectations. She shared the NHM 2-5-10 year vision and asked the compelling question, “what if we don’t do anything?” In short, we would be wasting resources and wouldn’t be fufilling our personal, institutional, national or governmental missions. The NHM presentation (Vince Smith) made clear the value and import of visualizing data to show such metrics as current number of records in the collection management system or how many papers are published and across what range of topics. Vince also related that external scientific review proved a valuable process to go through for validating collections digtization usefulness. What are the biggest challenges and the best outcomes at the regional sector? How do you get your scientific collections voice heard at the higher levels? Museums are not seen as scientific organizations and some seem to care little about the data as a resource. Is this a problem in the US? How do we get our collections data cited, down to the level of individual specimens? What makes the most difference? How do we share expertise? hardware? capital? knowledge of digitisation across UK regions (and further)? What data cleaning, post-processing has to be done? how to justify value of our collections? how to support the expertise? is it our goal to change our view of ourselves overall – our purpose, our r’aison d’etre? Now grounded with information about current issues surrounding the state of digitisation, we broke up into three groups to take on the tasks of: 1) definining benefits of digitisation and possible collaboration models to get the work done, 2) defining audience and stakeholders for this data, and 3) coming up with a vision, with a mission, and overall story (if time!). You can see just a bit of our process to come up with a vision statement here. The workshop organizers plan to publish a report summarizing findings and asking for your ideas on the workshop wiki from 26th April, a date chosen to coincide with the annual gathering of natural sciences curators at this year’s NatSCA conference. Still here? We jump now to workshop two where you still find us at the amazing M Shed venue – but now we switch focus to those inside the museum collections looking to start mobilising their unique regional holdings. How do we do this in practice? Workshop Two. UK Practical Digitisation. On 9th March 2018, fifteen of us reviewed the overall digitisation process using the Five Task Clusters as a guide. By request, we included two hands-on sections introducing mapping collections data to the Darwin Core Standard and best practices for georeferencing collections legacy locality data. 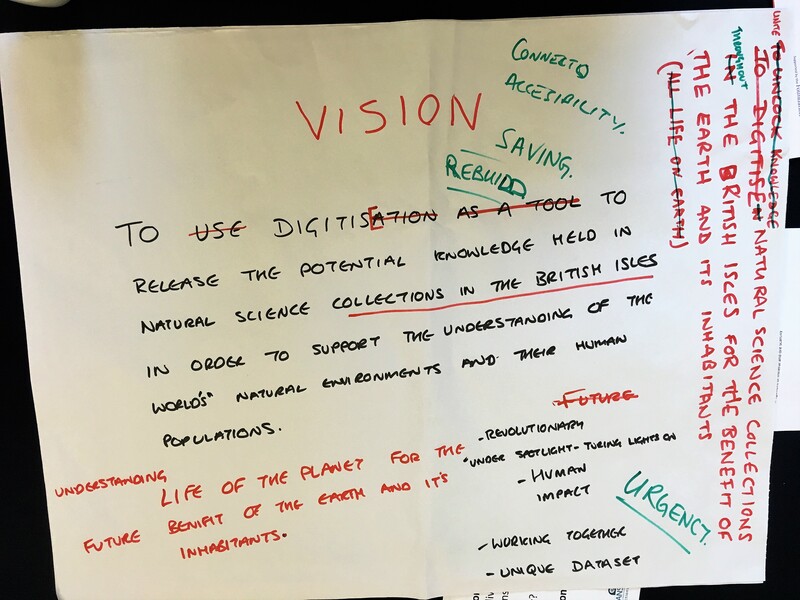 The overall vision encompasses a plan to develop and repeat this foundational workshop to help upskill natural sciences curators in other UK regions. The South West region’s collections hold objects of regional, national, and worldwide importance and participants gave talks about irreplaceable treasures, currently effectively hidden from large-scale biodiversity research. This information illuminated the challenges and scope of tasks and inspired us at the same time with the need to move forward in a timely fashion. The core development team’s one-month post-workshop meeting will include a debriefing session about how the event went and time to answer and address unresolved issues and next steps. From an iDigBio point-of-view, this event provided a novel chance to share what we have learned from the ADBC community about collections digitisation, and an opportunity to help the Southwest UK region discover and address issues to enable digitisation success and set up a model for all regions across the UK. The process of workshop design was collaborative with the SWANS team, with participants driving content, the NHM helping answer UK-related questions and iDigBio shaping the agenda from the desired topics. We look forward to more such opportunities. Bonnet R. Regional training, skills, and collections analysis of museums with natural sciences collections in the south west. 2016 SWANS Project Report. South West Museum Development Programme. 2017 blog post: John Ellerman Foundation Project (SWANS Project) South West Area Natural Sciences Collections Project. UK Strategy Planning Team. UK Strategy Workshop (2018). See annotated wiki with links to all talks and documents for this workshop. UK Practical Digitisation. UK Practical Digitisation Workshop (2018). See annotated wiki with links to all talks and documents for this workshop. This article is reposted from Integrated Digitized Biocollections. ← When Museums Get it Wrong – Did We Accidentally Accession Someone’s Holiday Booze?